Der Hyena Exporter ist ein gesondertes Programm und ist im Lizenzpreis von Hyena Enterprise enthalten. Der Exporter unterstützt den Export von verschiedenen Systemwerten wie z.B. Services, Shares, Windows NT users and groups, Security settings for files, shares, printers, services, and registry, WMI information, Files and directories, including version information, Active Directory, including user photos, Network settings (tcp/ip address, network cards, etc. ), Account and audit policies in eine Datenbank, oder Tabellenkalkulation. 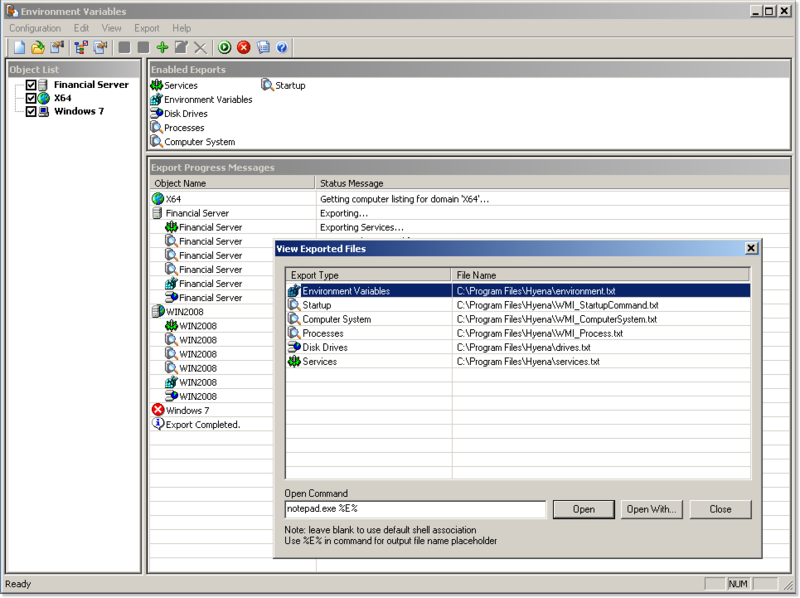 The registry, WMI, File/Directory, and Active Directory export options utilize user-definable templates for an unlimited number of possible output configurations. Exporter Pro also supports exporting and consolidation of logon-related information (such as user last logon) from all domain controllers.